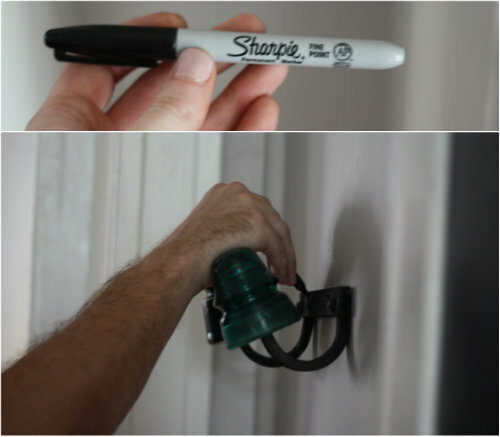 Over the long weekend I mentioned Tim taking on one of the most creative DIY projects I've seen, and have been excited to share the details here on the blog. 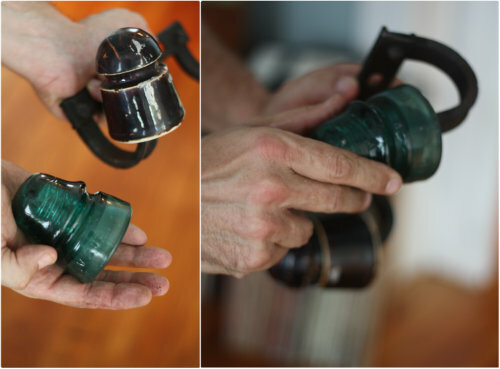 Several weeks ago I brought home a small collection of antique blue glass electrical insulators (like these) from my grandmother's home. They have sat out on her front stoop for as long as I can remember and were a little memento I wanted to keep of hers — thinking we'd find a good place for them to sit in our home as decor. When I brought them home, I admittedly didn't know that they were insulators, but with Tim's electrical background, he was able to tell me what they were immediately. Evidently, these glass pieces were used on the tops of electrical poles and the backs of homes to to connect and wrap cable wires from, while keeping the conductors separate. 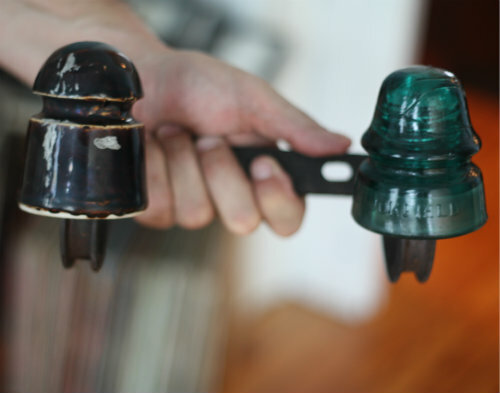 Over time, the advanced design of wires and cabling negated the need for these types of insulators and they've since become antique collector's items. While he was up there trying to get the insulator down, he told me after looking at the metal bracket it was attached to that he had an idea for re-purposing the entire piece into a coat rack for the house — so he used a hack saw to detach the entire bracket from the rusty screws holding it into the brick wall on the back of the house. We realized that the insulator on the back of our house was actually porcelain rather than glass and there was only one in tact rather than two. 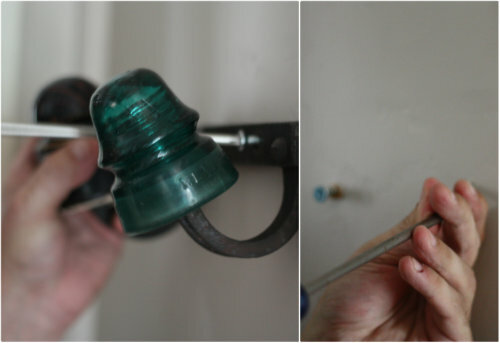 This is where the little collection of blue glass insulators I brought home from granny's house came into play. Tim took the smallest one and just like it was fate, would you believe it screwed right into place on the bracket? I couldn't believe it — we were both weirdly excited. 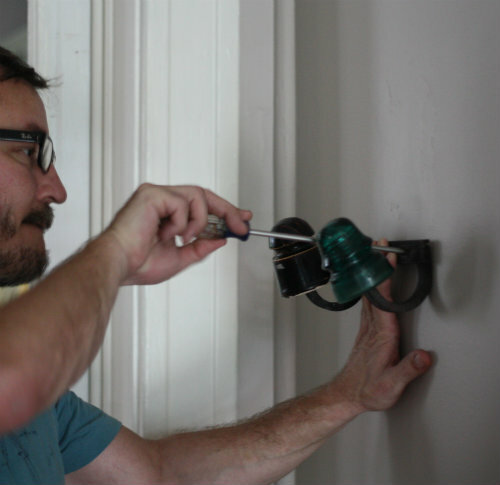 After testing out a few different spaces to hang the bracket, we decided to install it just under the space where Tim repaired that huge hole in the wall. This is a narrow spot right next to our hall closet and the bracket just seemed to fit well there. The screws were a bright steel finish, so we whipped out the trusty old sharpie pen to give the caps a little touch up airbrushing job in order to match the rest of the black antiquey bracket. Fancy trick, eh? 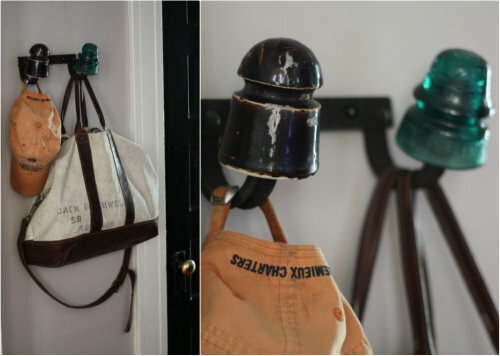 After making sure the bracket was securely attached to the wall, we began testing hanging different odds and end on it like coats, hats and different bags. 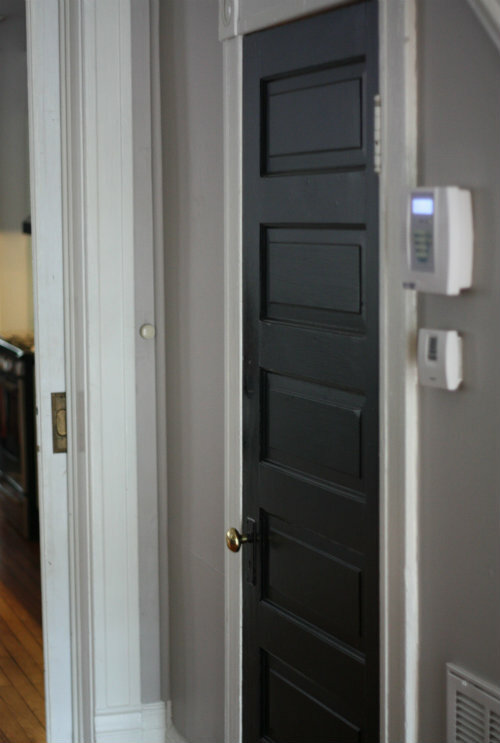 It works like a charm and even adds to the feeling of this being the hall closet area. 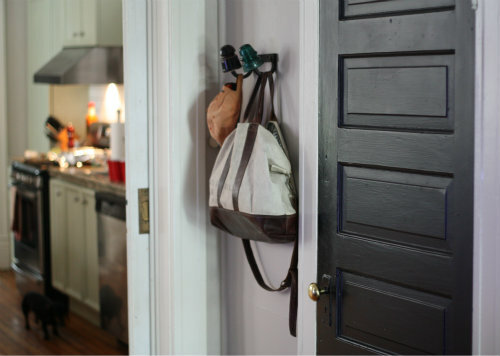 It will be perfect when guests come over and just need a place to hang their coats, bags or other belongings. 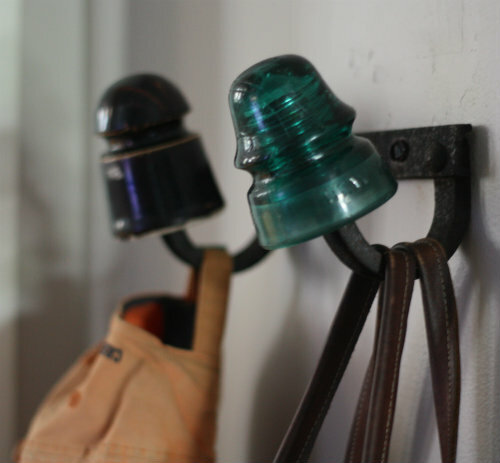 We like that the two insulators are a little mismatched and funky, adding a little vintage charm, history and dimension to that previously bare space on the wall. We're particularly fond of this little diy rack we made in that we were able to salvage and re-purpose an antique piece of history from our own house, not to mention a little piece of history from my grandmother's house (who also happened to grow up within 1 block of the same street we now live on). It's like this amazingly functional piece of mixed history that we now use everyday — and holds special meaning at the same time. Since making this little wall rack, we've found ourselves looking at the backs of all the fan houses we pass by on our walks with Basil — talking about how cool it would be to make more. Two or even three placed side by side in a wider area would make for a really cool looking wall rack. 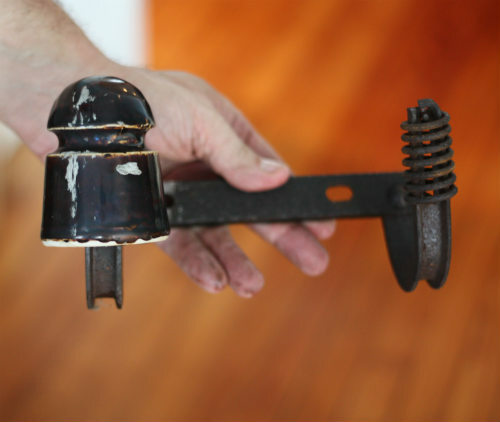 If you live in an older home, it's quite possible you might have one of these metal brackets and just maybe an insulator or two still in tact on your own home. This is something I would have had no idea about or thought twice about getting rid of before Tim came up with the idea. Now I feel like we have such a prized little possession on display in the home. Have you re-purposed a family heirloom or something you thought you'd never use from your home into something new and functional that you love? Thanks Lisa, we're pretty smitten! You are too kind — we have fun with it all and really appreciate your reading! I've seen lots of insulators but this is the first time I saw the bracket that held them to the house! COOL! Thanks for telling us about them. LOVE love LOVE your 'new' use for it. Very amazed and impressed! Thanks so much Karen! We were stoked to find the full bracket too. Just this morning on our walk we spotted a triple bracket on the back of an apartment complex here in the city — how cool would that be! Adorable! Perfect use for it, looks great! I have probably 2 dozen insulators at my parents house of varying colors. Now I'm wondering at their potential! Jess, this was quite a fun and unique project. If you ever walk through the alleys of the fan you see these on the back of most houses just hanging up there. We want to take a ladder and get them all! I have about 10-15 clear glass ones from when Joyce collected them, and they ended up in Mom's garage. I have no idea what to do with them!